With the chamber loaded, all that is necessary to fire the gun is to push in on the safety so that the red warning band is visible on the left side of the trigger guard and pull the trigger. The gas system ejects the fired shell and picks up a new shell from the magazine and chambers it automatically. This is repeated each time you pull the trigger until the last shell has been fired. AFTER SHOOTING, IMMEDIATELY PLACE THE "SAFETY" IN THE "ON SAFE" POSITION. tubes in barrels threaded for Invector-Plus tubes. Failure to follow these warnings may damage your gun and cause injury to yourself and others. A special "Plus" choke tube wrench is provided to remove and tighten Invector-Plus choke tubes. DO NOT FIRE THIS SHOTGUN WITHOUT HAVING AN INVECTOR CHOKE TUBE INSTALLED. Permanent damage may result to the threads. DO NOT USE BROWNING INVECTOR CHOKE TUBES IN ANY SHOTGUN BARRELS NOT SUPPLIED BY BROWNING. ALSO, DO NOT USE ANY OTHER CHOKING DEVICE IN ANY SHOTGUN BARRELS SUPPLIED BY BROWNING. USE ONLY CHOKE TUBES MARKED INVECTOR. CAUTION: WHENEVER HANDLING ANY SHOTGUN FOR THE PURPOSE OF REMOVING OR INSTALLING A CHOKING DEVICE, MAKE ABSOLUTELY CERTAIN THE GUN IS FULLY UNLOADED, AND THE BOLT OR BREECH IS OPEN! NEVER ATTEMPT TO REMOVE OR INSTALL A SHOTGUN CHOKING DEVICE ON A LOADED FIREARM! The 20 gauge Gold shotgun's barrel is threaded to accept the Browning Standard Invector Interchangeable Choke System. The word INVECTOR denotes that the barrel is threaded. The degree of choke is indicated twice on each choke tube: Inscribed on the side of the tube, and indicated with a "notch" code on the top rim of the tube. Browning 20 gauge Standard Invector choke tubes are made with tempered steel and are fully compatible with all FACTORY AMMUNITION (loaded in compliance with SAAMI specifications) including Magnum lead and steel shot loads and rifled slug loads. Browning's universal tube wrench is used to remove and install these tubes. 1 UNLOAD YOUR GOLD SHOTGUN FULLY. INSPECT THE CHAMBER, FEED MECHANISM AND MAGAZINE TO MAKE SURE THEY DO NOT CONTAIN ANY SHELLS. 2 Open the action, locking it rearward, and place the "safety" in the "on safe" position. 3 Use the Invector wrench to loosen the tube, turning it counterclockwise. Finger twist the tube the rest of the way out of the barrel. 2 Open the action and place the "safety" in the "on safe" position. 3 Before installing a tube, check the internal choke tube threads in the muzzle, as well as the threads on the Invector choke tube to be sure they are clean. Lightly oil the threads with an oil like Browning Oil. Using your fingers, screw the appropriate tube into the muzzle end of the barrel, tapered end first, notched end outward. When it becomes finger-tight, use the Invector choke tube wrench to firmly seat the tube. THE INVECTOR CHOKE TUBE SHOULD BE PERIODICALLY CHECKED TO ASSURE THAT IT IS TIGHT AND FIRMLY SEATED. BEFORE CHECKING, FOLLOW THE SAFETY GUIDELINES OUTLINED ABOVE. To help you choose the correct choke tube for each hunting situation, all Browning Invector choke tubes are inscribed on the side with the patterns they produce with both lead and steel shot. Each Invector tube also has notches on the top rim of the tube. These notches are a code to allow you to determine the choke designation while the tube is installed. Rim notches refer specifically to lead shot. You will need to use the chart below to cross-reference from lead to steel, and determine the appropriate tubes for your ammunition and hunting/shooting situation. Browning Consumer Department One Browning Place Morgan, Utah 84050-9326 (801) 876-2711. Browning Canada Sports Ltd./Ltee 5617 Chemin St-Francois St-Laurent, Quebec H4S 1W6. (514) 333-7261. To identify individual Invector tubes, refer to the abbreviated indications on the side of the tube, or use the identification mark(s) located on the top rim of each tube. (See Figure 19).
' When more than one choke designation is listed for a giivn steel sbo! pattern, use the more open choke listed for high ivlocity, larger shot size steel loads. $i\o! for use with steel shot. Using an oivrtlght choke constriction with sice! shot will result in an itie/feetice, "blown"pattern. "Extra l ull Special with knurled rim. Do not use with steel shot. 'When more than one choke designation is listed for a giivn steel shot pattern, use the more open choke listed for high ivlocity, larger shot size steel loads. Periodically oil the '/fïils on * the ifj&ide of the receiver. Tue (¡old shotgun bandies mixed loads of 2 .W and 3' shells. tem components. A complete cleaning requires removal of the holt and trigger group. Ordinary good judgment will indicate that the metal parts of a gun should receive a light film of oil after the gun has been exposed to weather or handling. 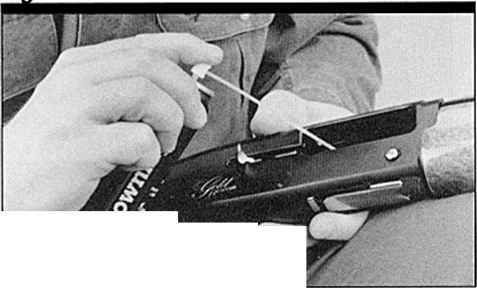 Occasionally a small drop of light gun oil may be placed inside the receiver on the rails on which the bolt slides (See Figure 20). This will help to relieve friction and ensure smooth operation. If the gun has been exposed to a lot of dust, dirt, mud or water, the principal working parts including the gas system, should be wiped clean and lubricated with a light film of oil. Browning Oil is recommended. DO NOT POUR LARGE QUANTITIES OF OIL INTO THE ACTION. A LARGE EXCESS OF OIL WILL RUN BACK INTO THE WOOD OF THE STOCK AND CAUSE SOFTENING OF THE WOOD, WITH CONSEQUENTIAL LOOSENING OF THE STOCK. All Browning Gold semi-auto shotgun barrels are completely interchangeable within gauge. No special fitting is required. You should clean your Gold shotgun whenever it becomes excessively dirty. The barrel should be cleaned and the action wiped clean and oiled after every day of shooting. The gas system should require only occasional cleaning. If a malfunction occurs, perform a thorough cleaning, to see if it solves the problem, before seeking the services of a Browning Recommended Service Center, the Browning Service Facility in Arnold, Missouri, or a competent gunsmith. 1 BE CERTAIN YOUR SHOTGUN'S MAGAZINE, FEED MECHANISM AND CHAMBER ARE UNLOADED. PLACE THE "SAFETY" IN THE "ON SAFE" POSITION AND LOCK THE BOLT TO THE REAR. ALWAYS WEAR PROTECTIVE SAFETY GLASSES DURING ALL DISASSEMBLY AND CLEANING PROCEDURES. 2 Remove the barrel so that it can be cleaned from the breech end (See "Disassembly" on page 8). 3 Using a shotgun cleaning rod with tip and patch large enough for a snug fit in the bore, insert the rod and patch in the breech end of the barrel and run back and forth through the bore several times. Remove and wipe the Invector tube, threads and barrel threads with a brass or nylon brush, and lightly oil. 4 Inspect the bore from both ends for leading by looking through the bore toward light. Leading will appear as dull longitudinal streaks and is usually more predominant near the muzzle and just forward of the chamber. 5 A normal amount of leading can be expected with today's high-velocity loads and improved wads but this is not serious. If or when leading should become heavy, it can be removed with a brass bore brush. Make sure a choke tube is installed. Spray the bore or the bore brush with a good powder solvent, and scrub the bore until leading is removed. To prevent brass bristles from breaking off, the brush should be pushed completely through the bore before being withdrawn. 6 After leading has been removed, the bore should be wiped dry with a clean patch, and then a lightly oiled patch run through it for preservation. 7 Reassemble barrel and wipe all exposed metal surfaces with an oiled cloth making sure to wipe gun clean of all finger marks where moisture will accumulate. 8 The barrel and action should be inspected to assure that all cleaning patches have been removed and nor inadvertently left in the barrel or action. 9 The wood surfaces can also be wiped with Browning Oil or they can be polished with any quality furniture wax (but not both). 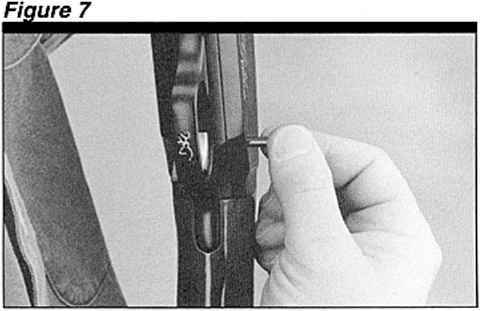 1 When the action becomes excessively dirty, remove the trigger group and bolt assembly from the receiver as explained under "Full Disassembly" on page 9 and 12. Clean with an oil such as Browning Oil or a gun solvent as necessary, using an old toothbrush to loosen any caked-on grime. Wipe the receiver cavity clean. Lightly oil the cavity (aerosol Browning Oil is ideal) and wipe it dry. No further disassembly is required for cleaning. 2 Reassemble the trigger group, bolt assembly, gas system and the barrel to the receiver as explained previously. Then wipe all exposed metal surfaces with an oiled cloth, making sure to wipe clean all finger marks where moisture will accumulate. 3 The barrel and action should be inspected to assure that all cleaning patches have been removed and not inadvertently left in the barrel or action. 1 Remove the gas piston and piston sleeve from the magazine tube. Spray the magazine tube with a good quality powder solvent and wipe clean. 2 Spray the piston and piston sleeve with a good powder solvent and brush it thoroughly to remove any deposits (an old toothbrush is ideal). Spray the inside and wipe off any buildup. It will be easier to remove the piston sleeve spring to clean the interior of the piston sleeve. NEVER use a steel brush on any of the gas components. 3 Complete the cleaning of the gas system by applying a very light film of Browning Oil to all parts for protection and lubrication. DO NOT TAKE YOUR GUN'S ACTION APART BEYOND WHAT IS EXPLAINED IN THIS MANUAL. This is a specialized, finely fitted mechanism; an attempt to remove the inner mechanism may mar it for life. It is unnecessary, and may do damage to the inner mechanism, to disassemble it for routine cleaning and oiling. Of course, misfortunes (such as dropping your gun in water) require appropriate attention, and in such circumstances we recommend you immediately take your gun to a competent gunsmith. What is a choke tube on a shotgun? How to tell shotgun chokes? How do i determine the size of a shotgun choke? How to install shotgun choke tubes? How to properly clean and oil a shotgun? What does the notches in bennilla chokes? What are the marks at the end of the benelli m2 choke tube? Do you need 3 shot adaptor for browning gold shotgun? How should a choke be inserted in a shotgun? How to tell what choke is in 12g barrel without removing? 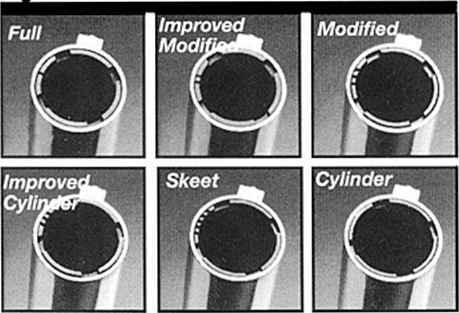 How to tell shotgun choke pattern notches? Are browning golds good guns? How much for a used browning invector plus 12 gauge semi auto? How do tou sleeve the piston on a Browning Gold shotgun? Can you use steel shot with browning gold shotgun?